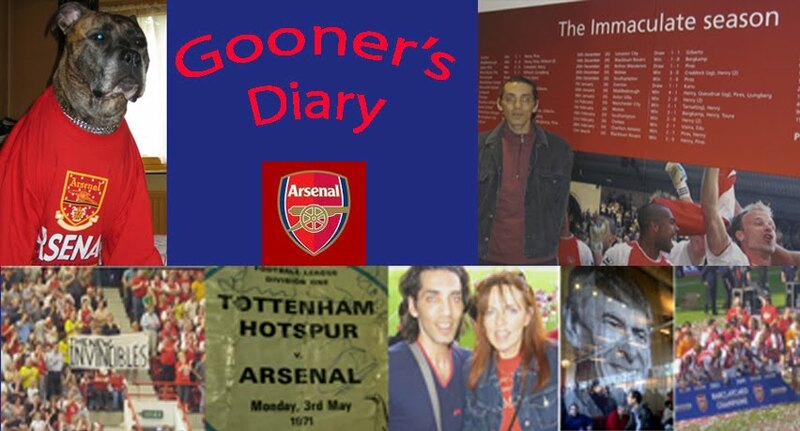 Gooner's Diary: Over, But Definitely Not Out! Over, But Definitely Not Out! In answer to the couple of queries amongst last week's comments, as I've mentioned below, I was fortunate to attend the Shareholders Q & A with le Gaffer last Thursday, after a shareholder mate of mine allowed me to use their invite. So a couple of you were correct in your belief that it was me who was see on on the broadcast on Arsenal TV, putting the penultimate question to Arsène. It was interesting, as Wenger took a couple of questions about the club captaincy at the beginning of the session, with one shareholder wondering if the fact that 8 or 9 Arsenal players had worn the captain's armband in just this one season, had somehow demeaned the honour afforded to victorious club captains of yesteryear, like Frank McClintock and Tony Adams. In response Wenger suggested that it could be viewed as a positive, that there were 8 or 9 potential captains in our present squad. He also referred to his belief in collective responsibility and went on to describe two types of captains, in terms of one who's highly-visible in the media, making all the right noises at the appropriate times and the more reserved type, who might be less vocal, but who demonstrates his leadership capabilities in the manner in which he conducts himself, both on the pitch and in the dressing room. Personally I've always sensed that Arsène doesn't set too much store in the captaincy. His habit of handing out the armband to whoever happens to have seniority in his lime-up that day, leads me to conclude that he views it more as a token recognition of time served, rather than having any great expectations that the wearer will automatically adopt a role as the obvious team leader. Perhaps AW chops and changes captains according to whoever happens to be the elder statesman on the day, in the hope of seeing one of his players blossom with the additional responsibility and suddenly demonstrating the sort of leadership qualities which hadn't previously been apparent. However, le Gaffer would never be heard denigrating his squad, or their attributes in public. Yet it seems to me that in the absence of any obvious leadership candidates in our current squad, he's forced to rely on the principles of collective responsibility that they share amongst themselves. There was a brief moment at last week's Q & A where he near as damn admitted as much. Having left it almost to the very end of the session to return to the subject, I suggested (although doubtless not nearly so lucidly, as there's a distinct sense of disconnection between my gob and my brain, whenever I try to speak off the cuff in public) that when I looked around at the players trudging off the pitch at half-time in our two recent, devastating defeats, it was obvious that their heads had dropped and I couldn't envisage any of them having the strength of personality, or the character traits necessary, to truly rally their team mates, by instilling in them the determination and the belief to be able to turn things around. Bearing in mind the extremely young average age of Arsène's current squad, I asked him whether he thought we might benefit from having a leadership figure, with the presence and stature of the likes of Puyol or Terry. Perhaps I was mistaken, but it seemed as if our manager dropped his guard momentarily, by admitting "what team wouldn't benefit from this sort of leader", before qualifying this by stating that the two quick goals scored by Man Utd were such a mighty blow and left our lot so crushed that no-one, or nothing could've succeeded in lifting their morale. Arsène may never admit as much and will continue to try and convince us that his team can overcome with multiple captains on the pitch, but I rather suspect that he'd be no less delighted than the rest of us, to discover someone with the sort of ideal personality to be "the daddy" on the pitch. The problem being that these sort of players just don't grow on trees. You can count the Premiership's genuine leaders on the fingers of one hand and they are all homegrown! So Arsène could try to draft in a little more strength of personality and bolster the more timid members of the Gunners squad, with the sort of players who have the presence and stature necessary to command both fear and respect in equal measure, when lining up with the opposition in the tunnel prior to a game, but in truth no matter the size of the obscene transfer fees and the hyper-inflated wage packets, these will never buy us that "die for the cause" determination, which the likes of Carragher, Terry and Neville have been steeped in since they were in short pants. Gary Neville may not have the same intimidating aura as Roy Keane, but even in the absence of Utd's current club captain, there are a sufficient number of strong personalities in Fergie's squad for them to be able to stand firm, when it look as if the wheels are beginning to come off. There's no problem with the Arsenal's ethos of collective responsibility when we are going great guns, but it's been blatantly obvious for several seasons now that this squad is devoid of that rock of stability needed to be able to build a bridgehead when things begin to go awry. There was a time when I thought Philippe Senderos might have what it takes, personality-wise, but sadly it seems Phillipe couldn't make up for in character, for what he lacks in basic ability. I've yet to see anyone in red & white since, who's come across as having anything like the necessary outgoing personality on the pitch to carry it off as a genuine leader of men. I ask myself if I had the misfortune to walk into a boozer full of Spurs fans with the Arsenal squad, our captain should be the one player I'd instinctively want to be hiding behind when the fists start flying. Whereas sadly these days I'd probably be wanting a piggyback from Theo, to ensure I didn't get left behind, in the dash for the door! There were complaints at the Q & A that following Kieran Gibbs' costly slip against Man Utd, none of his team mates came over to put a reassurring arm around the youngster. Wenger contended that Van Persie did actually make an effort to console Keiran. I can't honestly recall seeing Robin assume the responsibility for trying to boost our young full-backs seriously deflated morale. But I do remember being similarly disappointed a few days later, at the forlorn sight of Kolo lying on the deck staring at the grass, after having inadvertently turned the ball into our own net. Instead of anyone rallying around to try and pick Touré up both physically and psychologically, his team mates turned their backs to prepare for the restart. If Wenger knows that the attributes which we've been most found wanting for when the chips are down, are not available to purchase off the shelf, then perhaps he's correct in trying to carry on regardless, in the hope that what doesn't kill his young squad, will make them stronger and that they will eventually discover the necessary spirit of togtherness, as a result of what they've been through. However I for one will be going to Friday's first-leg of the FA Youth Cup final, not primarily interested in witnessing evidence of the same brand of football being played throughout the club. As happy as I would be to see Jack Wilshere running rings around the Scousers and demonstrating that he might soon be ready to challenge the likes of Arshavin for a first XI place, I will be far more excited if the likes of East Londoner Jay Emmanuel-Thomas, Manny Frimpong (who despite playing for England youth teams was born in Ghana and who has something of the all-action, box-to-box energetic style of his compatriot, Michael Essien about him), Bolton born centre-back, Kyle Bartley (apparently a gentle giant who needs to acquire more of a mean streak), or in fact any of this extremely promising bunch of youngsters are showing signs of the sort of confident, extrovert and vocal on pitch persona, that might be combined with a do or die commitment to the Gunners cause, to mark them out as potential fast-track candidates for the captaincy of the first team. Sadly it seems to me that in an era where these prodigies are made all too acutely aware of their multi-million pound value at such an early age, with a coterie of agents and assorted liggers prepared to do their every bidding, it's rare to see any of those at the very top level, tearing about the pitch with total 110 per cent commitment. Perhaps their young egos are massaged so much that they feel they've little to prove, or perhaps the intense hunger one might expect at a point in their lives where 90 minutes of football can make or break a career, is inhibited by the fact that they've becomes far too focused on selfishly protecting the tool of their trade, to be throwing themselves about the pitch in any sort of reckless fashion for the cause of any one club? I was watching one of those marvelously nostalgic (at least for those of us old enough to remember the respective era) "Time of Their Lives" episodes on Sky Sports a couple of weeks back, where three of Bill Shankly's Liverpool side from the 70s spoke of one of their colleagues coming out for the second-half with a broken collar bone. Apparently his only concession to his injury was that he avoided taking throw-ins! Such selfless devotion is a million miles from these mollycoddled modern times, where players are prepared to limp out of crucial encounters to be wrapped in cotton wool because they're suffering from such a critical affliction as tight hamstrings! Meanwhile I must point out that contrary to some exagerrated reports, Wenger didn't slaughter our home fans at this Q & A session. After commending our typically staunch travelling support, he merely reflected that at a time when such a young side is most in need of the home fans, to boost their morale, we could be more supportive, instead of getting on their backs by haranguing them. Our manager was merely voicing the concerns of all those of us, who feel that the extra twenty odd thousand capacity at our new gaff seems to be made up almost exclusively of the sort of nouveau football fans, who are far quicker to criticize if they don't get an instant return on the extortionate price of their match ticket, than they are to get behind their team. They don't seem to appreciate the football "supporters" unwritten contract, which necessitates keeping the faith, through thick and thin and where the highs of success are so much more rewarding, for having remained resolute through the despairing troughs of defeat. Arsène has also come in for criticism for the recent rumours linking him with the Real Madrid job. To my mind it would be far more likely that the tabloid media have spun this gossip to give it some mileage, rather than it being some Machievellian warning from our manager, a shot across the bows of all the ungrateful backstabbers, to remind them that they should be careful what they wish for. As far as I can tell, Wenger's only crime has been that where in the past he has only ever answered questions about managing other clubs with a straight bat, stating his intent to honour his contract with the Arsenal, on this occasion he caught an edge (and who knows if it was a googlie of a wuestion) when responding that the project of Madrid chief Perez would interest any coach. Then again, in light of the number of the absurd comments of the past couple of weeks, it wouldn't be so surprising if Arsène was beginning to wonder if his efforts are no longer appreciated by disloyal sections of the Arsenal's audience (as opposed to genuine Gunners' supporters). After all, we all need to "feel the love"! Myself I hope that I remain in the majority, with my conviction that "Arsène still knows" and I pray Friday will produce a healthy turn out at our place, to roar the kids on, to a decisive first-leg result in the FA Youth Cup, so that they can relax and enjoy a fitting celebration of the 20th anniversary of that Mickey Thomas moment in the second-leg at Anfield next Tuesday and be rewarded by returning with something to at long last occupy the unused men's (boys) team trophy cabinet which has sadly remained utterly barren ever since we moved to our new home. Here's hoping they can bring back what might turn out to be the first of many? It would’ve been some consolation if we could’ve pooped the Old Trafford party on Saturday. On the pitch, we seemed mainly intent on leaving some decidedly masculine reminders of our age range, on Patrice Evra’s shins! Yet fearing the sort of rout that ended Igor Stepanovs’ Arsenal career some seasons back, the majority of us were just grateful to see the Gunners salvage some pride, enabling us to come away from Old Trafford with our dignity intact, having given Utd a decent run for their money. Nevertheless I was disappointed that we were so toothless in the final third. Nasri failed to have the sort of significant impact he’d had in the reverse fixture and it certainly wasn’t Arshavin’s most influential encounter to date. Sadly even our subs failed to offer the expected impetus up front, with Theo no less anonymous against O’Shea, than he was against Evra a couple of weeks back and despite his alleged huge ego, Bentdner didn’t appear to have the balls to take the Utd defence on. If I owned an Arsenal share, I’d be forced to flog this investment just about now, in order to be able to afford our season ticket renewals. But I was fortunate to be able to attend a shareholders Q & A session last week, with our esteemed leader, as proxy for a pal of mine. Both here and in the build up to the match at Old Trafford, Arsène pointed our attention to the fact that the Gunners are only 3 goals short of the 67 scored by Saturday’s Champions, using this as evidence to contend that we are no less potent than Utd going forward and that it’s the anomaly in the number of goals conceded that has cost us most dear. However I’ve always retained a healthy distrust of statistics, whereas I worry that monsieur Wenger will spend his summer focusing on our 21 game unbeaten run and other more meaningless benchmarks, like Manuel Almunia’s 8 game clean-sheet record at our place, to the point where he might convince himself that the Gunners weren’t that far short of the mark. In truth, when all is said and done, the only really telling number is the potential 15 to 21 point gulf between us and the title-winners and it’s not the quantity of goals that counts, but the capacity to score the ones that really matter. It feels as if we’ve been moaning about our defensive lack of composure and our vulnerability at set-pieces, since the demise of the fab back five. Although Alex Song’s assured display as Kolo’s centre-back partner on Saturday was something of a broadside for the Hangeland bandwagon, even if this was Utd at their most unambitious. Yet the important difference being that in the past we’ve invariably been able to compensate for defensive errors, with the calibre of players up front, capable of conjuring a rabbit out of the hat when most required. Some might point to Adebayor’s poor return of only 10 league goals, but the Togonator notched up 24 last season and I’m convinced it can’t be a coincidence that we’ve been starved of silverware ever since, Henry, the club’s most prolific striker ever, was able to rely on the likes of Ljungberg and Pires to shoulder some of the goalscoring burden, with both banging in 15 odd from midfield. Whereas this season, we’ve only had 6 each from Nasri and Arshavin (4 at Anfield) to add to Van Persie and Bendtner’s meagre 9 goal tallies, with the remaining 20 league goals spread throughout the entire squad. Perhaps it would’ve been a different story, if our diminutive Russian had started the season and not been cup-tied in Europe. Hopefully in future Andrey (and perhaps A.N. Others?) might offer that single inspirational moment, which could’ve made all the difference in our abysmal Jan/Feb streak of goalless games. Any lingering hopes of a challenge petered out and without Villa’s subsequent spectacular collapse, we might have struggled to even qualify for the Champions League, as we began an instantly forgettable run of four successive 0-0 draws (at home to West Ham, Sunderland and Fulham and away to Spurs) 5 points behind Villa and 8 behind the leaders. By the time we travelled to the Hawthorns at the beginning of March, 6 points separated us from that crucial fourth place qualification for the Champions League, while Utd had disappeared some 16 points into the distance. Hopefully the inevitable rumours linking our manager with Real Madrid might shock some sense into those misguided Gooners who’ve lost patience with Le Prof. While other clubs have buckled under the burden of debt from new stadium developments, I can’t honestly see Wenger walking away, just as he comes within touching distance of an opportunity to realize his vision. What’s more, as far as I’m concerned, Arsène’s credit is good for at least another couple of seasons. Compared to the vast majority of clubs, it’s hardly as if we’re exactly suffering, while watching this “work in progress”. I only have to imagine the delight on the faces of our rivals, the day Wenger eventually departs, to remind myself quite how fortunate we are to have him. I’ve wanted a keeper capable of dominating his area ever since Spunky retired but it’s not an entire spine that this squad needs, as some might contend, since we’ve ably demonstrated that on our day, we are a match for absolutely anyone. But to grind out 3 points against the “park the bus” tactics of the lesser lights, or to triumph in adversity, we need to discover some real backbone of our own. I was envious of Jamie Carragher’s double-barreled assault on his “lackadaisy” full-back on Sunday. Such steely attributes are unlikely to be available off the shelf, but having supped defeat’s bitter draught so young, perhaps maturity will foster the iron-will necessary to turn this team into genuine winners?